For some time now, I've been tossing around the notion of rebranding this website, and I think the time is right to do so. 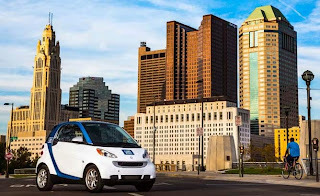 So welcome to Carless Columbus! 1. I've always been about pretty much anything except cars for getting around, and this is just an affirmation of that. 2. I wanted an easy-to-remember domain name, and bikecolumbus.com is already taken (not used, mind you, just owned by some IT firm up in Powell). 3. And now the big reason. For some time now, I've not been riding my bike to work nearly as much as I used to. The reason for this is fairly simple: now that my son is in school, I stop on my way home from work and pick him up to walk home. And though I'd ridden my bike on those days for a while, it was always a bit of a pain in the tuckus to handle him and the bike (my son is autistic, for those who don't know, and he's very impulsive). So for a long time now, I've been walking and riding the bus for work (though I have ridden on some days when I haven't had to pick up the boy). And, to be frank, without as much riding going on in my life, I didn't have much to say here on that topic. Other bloggers are doing a marvelous job of keeping up with the cycling world here in Columbus, so I am happy to let them be the bike specialists while I move on to something slightly different. 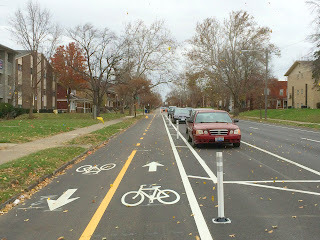 And as you may have noticed, I've included non-biking topics on Bike Commuting in Columbus in the past. Trains, COTA, walking, etc. have all been open for discussion here for a long time. And I felt it was time for me to make the change for the good of all of those. Because the message real doesn't change: getting people out of cars and onto bikes, onto their own two feet, onto Segways, into buses, etc. is all the same to me. The point is to improve people's lives via more and better exercise, less pollution and use of resources, and all the wonderful aspects of life that are improved by those factors. The evidence is increasingly overwhelming about the importance of low-impact exercise and staying on our feet as much as possible. Study after study after study is showing just how important it is to stay on our feet as much as possible. Our ancestors didn't sit in chairs all day at all. They were up and moving around, getting exercise and generally just keeping loose by being active. And they were free of many of the maladies that affect people today via their regular behavior. So anything we can do to keep our stress levels down, our exercise levels up, and our use of valuable and/or damaging resources to a minimum is a plus. It's amazing how all this fits together in a win-win situation. And that's what I want to celebrate here at the newly named Carless Columbus. So stand up and move! Thanks Matt! I should also have mentioned that I think it's important to present the information for walkers, cyclists, etc. as openly as possible and not pigeonhole each transportation mode into separate places. We're all in the same gang, so to speak! do I need to change my RSS feed to match new site? also, of the sites in your blog role, which should I focus on, and which are columbus specific? As far as which blogs to follow... depends on what you want. Yay Bikes is the best for community- and culture-based stuff. Consider Biking has lots of the news and political stuff. Obviously, there's some overlap either way. Ray George's Columbus Rides is great for event-driven stuff and lots of bike culture news from around the city, state, and world. Just thought of another one for news and commuter knowledge: Paul Dorn's Bike Commute Tips. Paul's the guy who got me started. Thanks, Dan! If you have questions you want to ask (that might prompt posts, especially) feel free to contact me!